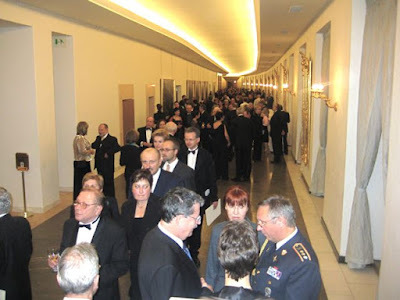 "[It is] a pleasure to stand in the window of a castle, and to see a battle and the adventures thereof below: but no pleasure is comparable to standing upon the vantage ground of truth.” Francis Bacon Sr.
Every October 28th, a few thousand of the Czech Republic's leading citizens are invited to the Independence Day ceremony at Prague Castle. On that date in 1918, Czechoslovakia became a country, emerging from the shadows of the Austro-Hungarian Empire. 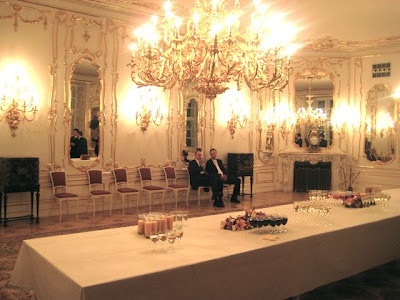 After a televised speech by the country's president and the awarding of medals to Czechs who have done great deeds, the great halls of the castles are opened to the guests who partake in food, drink, and schmoozing. And guests of the invited elite. Like me. There was a certain magic to the evening. 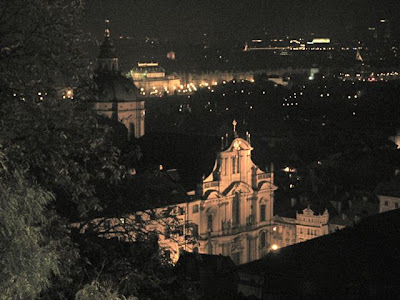 I've lived in Prague a long time, but I am always impressed as I approach Prague Castle, especially at night. 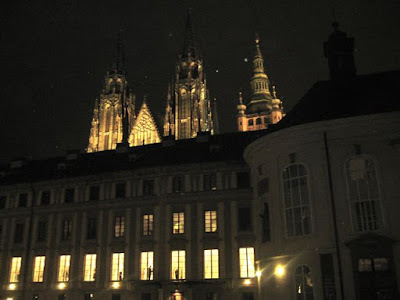 As we walked through the courtyard, St. Vitus Cathedral glowed above. 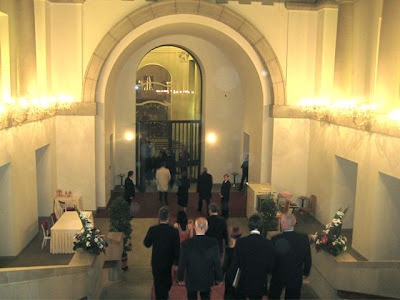 The castle windows blazed with light and the well-dressed guests could be seen walking by or standing with a drink, engrossed in conversation. 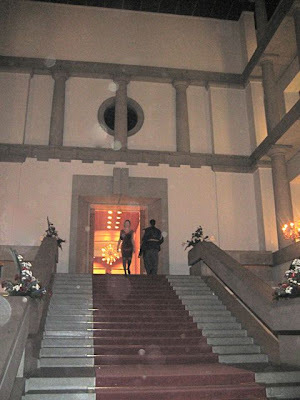 A red carpet covered the long, imposing staircase in the entrance hall. This part of the castle is not generally open to the public, so I'll take you along on a tour. 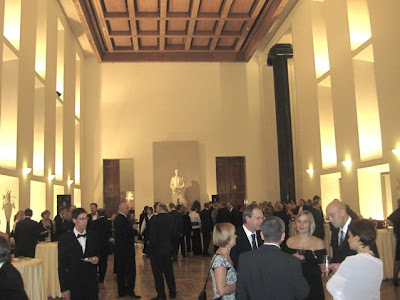 At the top of the stairs, was another large hall, with a statue of Tomáš Garrigue Masaryk, Czechoslovakia's founder and first president. I arrived in time to hear an all-girl saxophone band serenade the former prime minister, Jiří Paroubek, with the tune, "Jesus Christ, Superstar." The same group appears in the same spot every year. 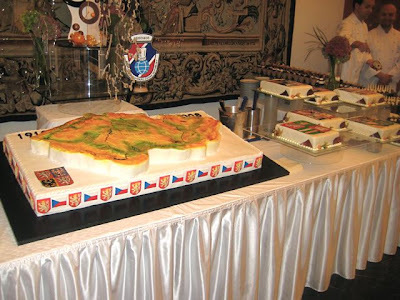 In the next hallway, there was a cake in the shape of the Czech Republic and other nationally themed desserts. 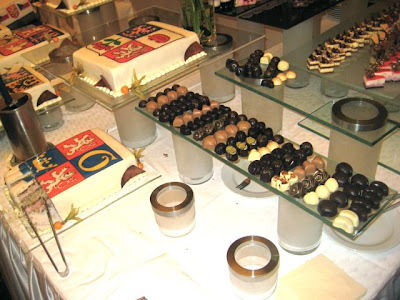 This is a blog about food and drink, after all. 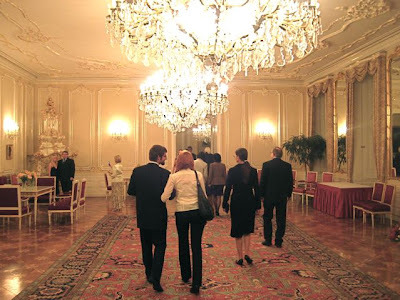 Then, I entered one of the grandest rooms in the castle, the Spanish Hall. 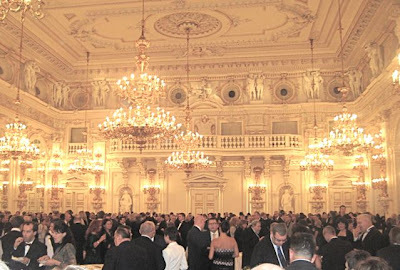 It was overflowing with VIPs -- government ministers, ambassadors, and leading business figures. 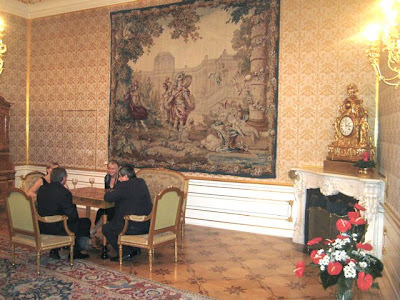 The Spanish Hall is the room the parliament uses to select the president. 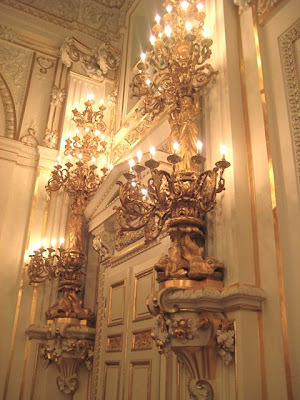 It was also famously given a modern lighting system by Vaclav Havel's friends, The Rolling Stones, in 1995. 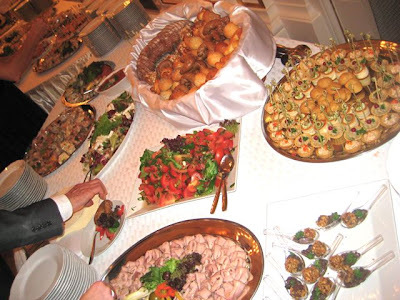 The tables were spread with platters of food, mostly Czech specialties. I was not familiar with some of the offerings, like nut-crusted, very dry meatballs on a spoon with mushrooms. There was a pastry cup filled with a pate I did not like. I had a salty mini-shrimp salad. 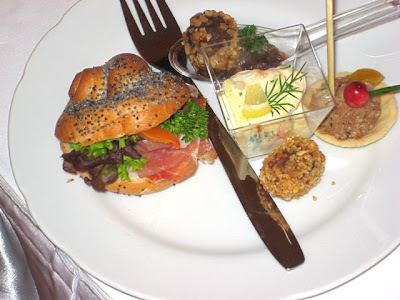 The best thing I had was a tiny sandwich with prosciutto. 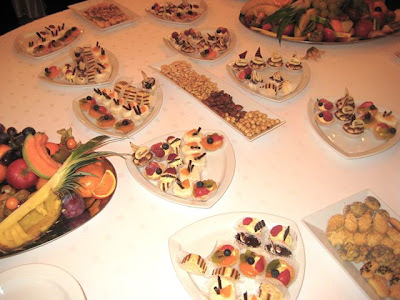 There were also platters with mini-fruit cakes and mini-tiramisus, but I wasn't much in the mood for those. 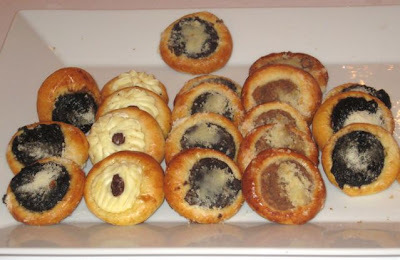 There were also more traditional Czech desserts, little cakes called koláčky. 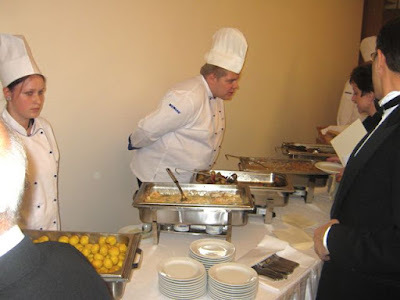 In another room, there were chefs serving hot dishes from heating trays. I tried the carved roast beef. It was OK, but fairly tough. Domestic beef, I'd say. 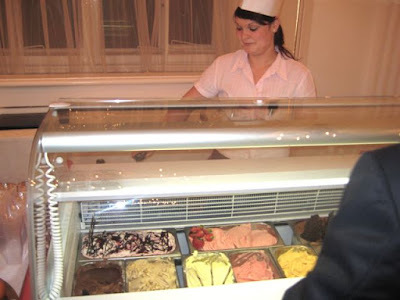 There was a little stand serving ice cream. 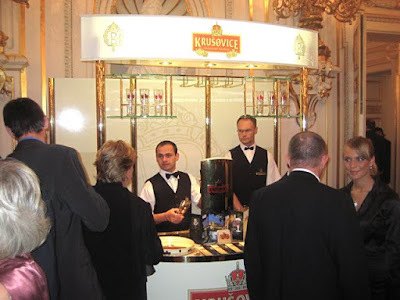 The beer for the event was Krušovice. I had a few of those. They were perfectly drawn from the taps. 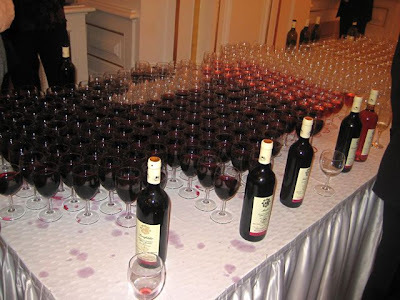 There was also wine available. Moravian, of course. 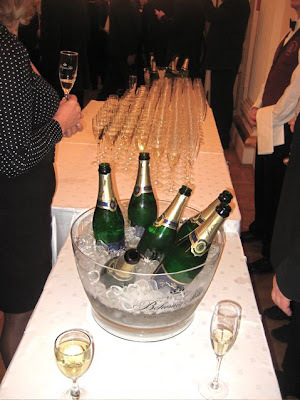 If you felt like something sparkling (and I did when I arrived), there was Bohemia Sekt. After getting a good picture of the food landscape, I wandered freely down the halls of the castle. There were many pieces of art glass created by Vaclav Havel's friend, Bořek Šípek. 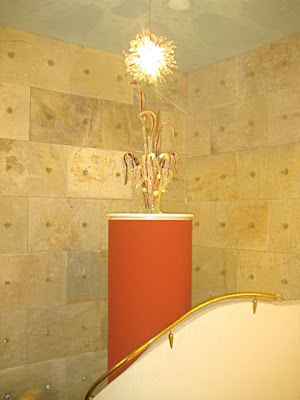 At the end of a long, modern design corridor, there was a beautiful golden-framed doorway. 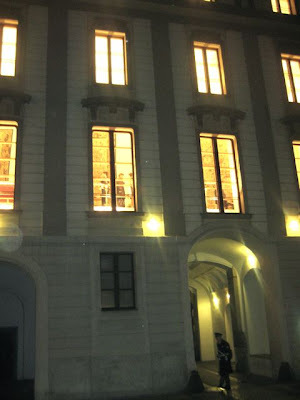 This was also part of the renovations carried out under Havel. 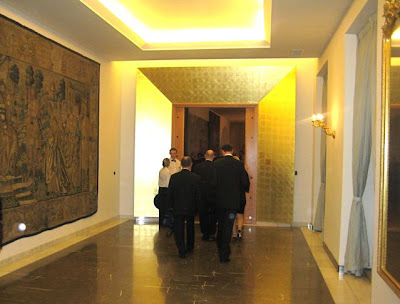 On the other side of the door is a small space where foreign dignitaries are sometimes greeted by the president. 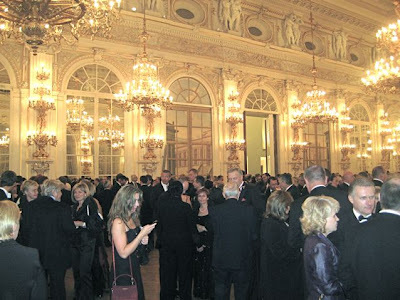 I didn't see the evening's host, President Vaclav Klaus. But I've run into him in past years. After this, I passed through of the most beautiful castle apartments. 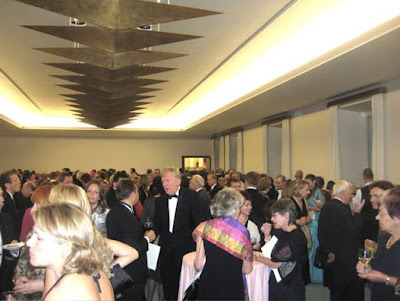 There were light refreshments available there, as well. They are beautifully restored. It felt like walking through the apartments of Versailles. One of the windows was open to let in fresh, cool air. There was a wonderful view of St. Nicholas Church and Malá Strana below. 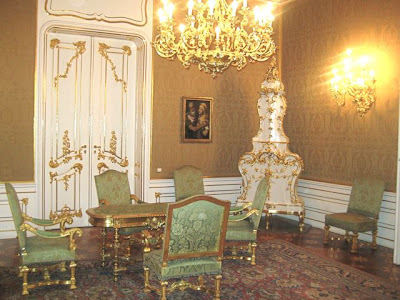 The rooms were sparsely furnished. 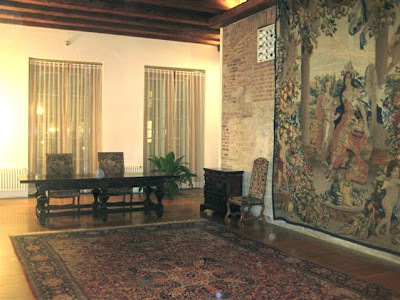 The chairs, tapestries, clocks all appeared to have some history behind them. The floors had gorgeous wood inlay. There were golden-framed mirrors everywhere. On the way out, I sampled a piece of the Czech Republic cake. 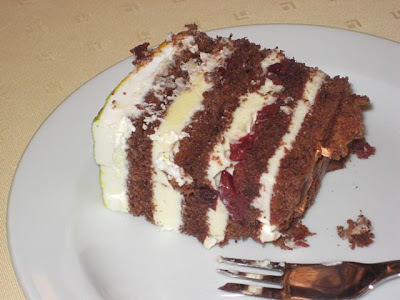 It was Black Forest, one of my favorites. And a pretty good version. 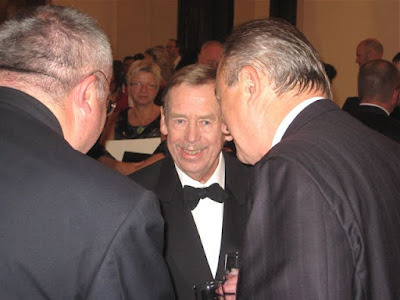 The cherry on top of the evening was rubbing elbows with Vaclav Havel, who helped bring about another form of independence back to Czechoslovakia -- the end of Communist Party rule. After that, it was time to head off down the stairs and into the misty air of autumn. Nice article, but your history is a bit awry. Vaclav Havel was not the man who helped bring independence back to Czechoslovakia. Well... perhaps your right if you take it literally. I was taking a little license and alluding to Havel's role in bringing about the end of Communist Party rule, which was imposed in 1948 and reaffirmed in 1968 by the Soviet Union.